1.2 miles west of Ashley Phosphate Road and 2.5 miles from the intersection of I-26 and Ashley Phosphate Road (3, p. 191). 1701  Earliest known date of existence when Joseph Child was granted 500 acres on October 16, 1701 laying on the north side of the Ashely River. He would increase his land holding to a total of 800 acres (3, p. 191).
?  Joseph Child built a house (3, p. 191). 1717  Upon the death of Joseph Child, his son Benjamin Child became owner (1). 1739  Benjamin Child died. It is unclear who retained ownership but the property did remain in the family; probably to Benjamin's daughter Mary Child. 1750  John Ainslie became owner after his marriage to Mary Child (1) (3, p. 191). 1776  John Ainslie died, leaving Windsor Hill to his daughter Hannah who was married to Captain William Moultrie, Jr. (1) (3, p. 191). 1796  Eliza Charlotte Moultrie and her husband Edward Brailsford inherited ownership upon the death of Eliza's father Captain William Moultrie, Jr. Captain Moultrie passed away at Windsor Hill on December 11, 1796 (1) (4, 127). 1837  The Brailsford family sold the property which contained 1,348 acres (1). 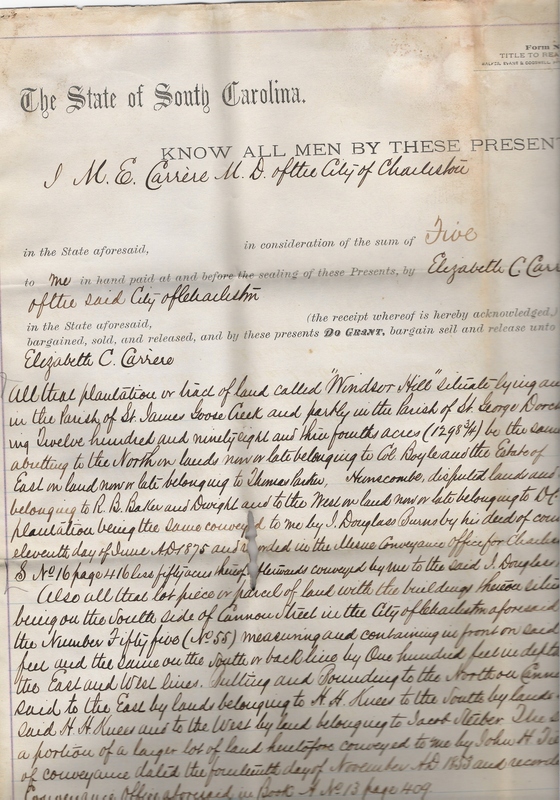 1875  1,298 acres were deeded from I. Douglass Burns to Dr. Maynard Edward Carrere on June 11, 1875 as noted in 1878 Conveyance. 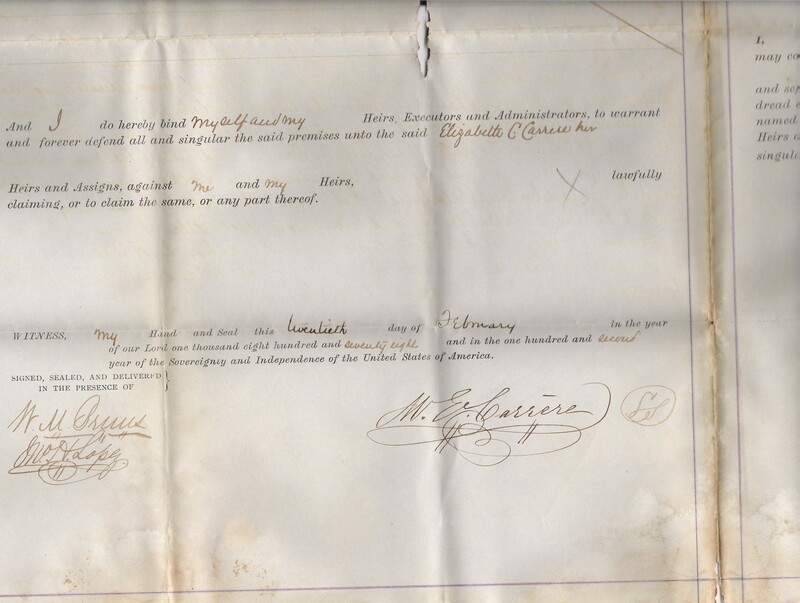 1878  Dr. Maynard Edward Carrere deeded land to his third wife Elizabeth C. Carrere (7).
?  Elizabeth C. Carrere eventually conveyed all but 50 acres of Windsor Hill to J. Adger Smythe (7). 1904  Henry Louis Koester became owner of Widsor Hill and farmed the timber off the plantation for the Jacksonboro Lumber Company. Mr. Koester left the plantation in a trust for his children (6). The Moultrie Family cemetery had been at Windsor Hill. This where Captain William Moultrie, Jr., his father, General William Moultrie, and several other members of the family were buried. General Moultrie's remains were moved to Fort Moultrie on June 28, 1978 and the other family members have been re-interred at the St. James, Goose Creek Church. (3, p. 192). Michael J. Heitzler, Goose Creek: A Definitive History: Volume One Planters, Politicians and Patriots (Charleston, SC: The History Press, 2005). Information contributed by Ashley Gregory Surles, the the second great granddaughter of Henry Louis Koester. Information contributed by John Strobel from the 1974 publication of the Huguenot Society of South Carolina.